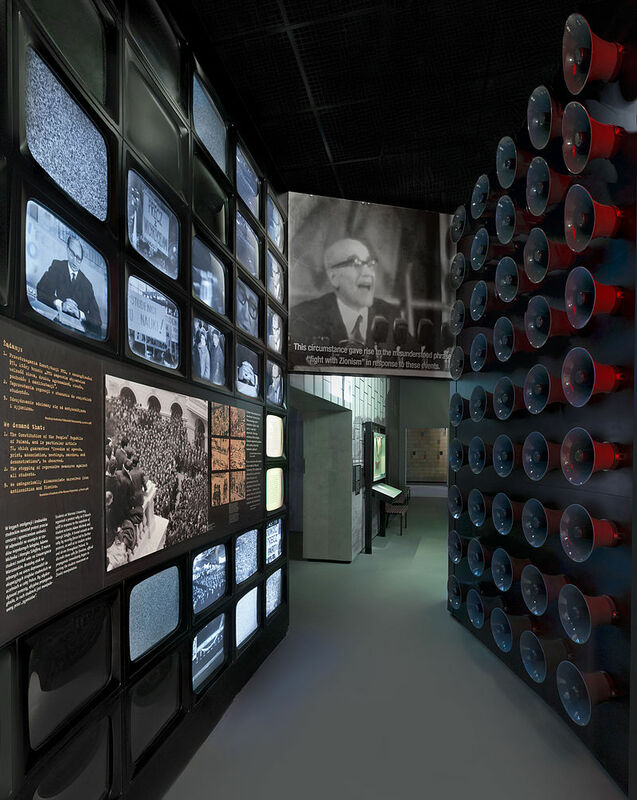 Part of the permanent exhibition dedicated to the March 1968 events at the POLIN Museum of the History of Polish Jews in Warsaw. The political crisis that wracked Poland in 1968 and the vicious anti-Semitic campaign that the Communist government pursued in its wake left the remnants of that nation’s Jews shocked and disenfranchised. While the crackdown on protests and riots throughout the country was indicative of the increasingly authoritarian nature of the Soviet-backed regime in Warsaw, its most lasting effects were on Polish Jewry, more than half of whom had emigrated within two years of what the government labeled its “anti-Zionist” campaign. This past March marked 50 years since those tumultuous events, and, to mark the event, the Polin Museum of the History of Polish Jews in Warsaw unveiled a multifaceted exhibit, which had been long condemned by nearly all in Poland, right and left alike. The museum’s efforts to preserve and disseminate this piece of history dually set off sharp criticism by extreme elements, some of whom accused the organizers of spreading anti-Polish sentiments; and at the same time, in spite of — or more likely because of — this unexpected controversy, the display was visited by more than 120,000 people, more than double the number that any other exhibit had attracted since the museum’s opening in 2014. While focusing the lion’s share of his time on a historical retrospective of the events of 1968, a lecture last Tuesday night at YIVO’s Manhattan headquarters by Polin’s director, Professor Dariusz Stola, attempted to capture the dual nature of the subject. “I will be switching between two moments in time, and I hope that it will not cause any confusion,” Professor Stola said at the opening of his hour-long presentation. By early 1968, years of increasing governmental attempts at greater control over Poland’s academic and intellectual community had reached a breaking point, with widespread frustration among students on university campuses, especially in Warsaw. Tension levels were such that the bizarre decision to cancel performances of a 19th-century play written by Adam Mickiewicz on the grounds that it was anti-Soviet sparked an uproar. The play’s cancellation was one of several events that sparked a series of protests demanding greater freedom of speech. They began at Warsaw University but quickly spread around the country. The movement was increasingly joined by young workers who were chiefly reacting to rising prices and other potentially destabilizing economic conditions. In many cases the protests, which were attended by thousands, were met with strong — and at times brutal — repression by police. On occasion, these confrontations devolved into riots. “The government began to fear that the rebellion would spread to industrial workers and, quite wisely, they decided to blame the Jews,” said Prof. Stola. Prof. Dariusz Stola, Director of the Museum of the History of Polish Jews in Warsaw. On March 11, two Polish newspapers — one an official government mouthpiece and the other a nominally Catholic one that was in reality controlled by Communist authorities — published articles “revealing” that the protests were in fact part of a well-coordinated “Zionist” conspiracy. 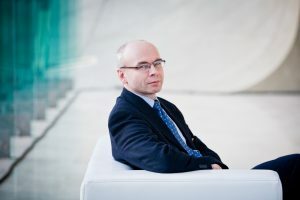 The ostensibly Catholic paper, run by a former fascist leader whose services had been employed by the Soviets after the conclusion of World War II, disclosed, Prof. Stola said, a “horrible secret that riots were the project of Zionists, Polish Jews and West German neo-Nazis,” working in tangent to undermine Polish Socialism. While now Jews became an especially convenient scapegoat, a systematic campaign against Jews in Poland had actually begun a year before, spurred by increased anti-Israel policies and rhetoric throughout the Soviet bloc in response to the Six-Day War. In the initial day or two of the Six-Day War, many Polish newspapers had taken a neutral or even sympathetic position to Israel’s fight against the coalition of Arab nations. Yet, by the third day, orders had been received from Moscow to change course and fall in line with the USSR’s condemnation of Israel’s actions — an order that was quickly obeyed by Communist authorities in Warsaw. 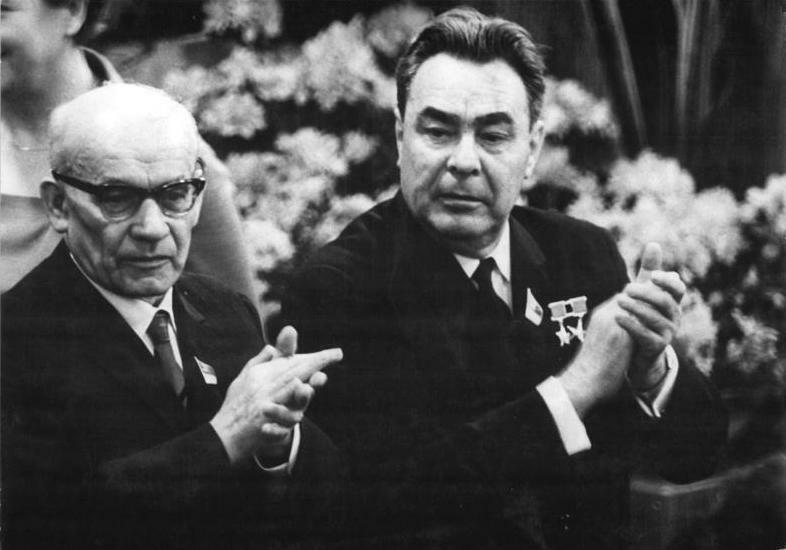 On June 9, four days after the war had commenced, Secretary Gomułka and Poland’s prime minister, Józef Cyrankiewicz, attended a meeting of Warsaw Pact nations in Moscow to discuss the situation in the Middle East. The result was a joint decision to break diplomatic relations with Israel and to offer increasing support to its Arab enemies. “Gomułka returned from Moscow seriously afraid that what was going on in the Middle East would set off another world war,” said Prof. Stola. Władysław Gomułka with Leonid Brezhnev in Berlin on April 17, 1967. With strong support from General Mieczysław Moczar, a communist hardliner and known anti-Semite, a campaign began, targeting influential Polish Jews. In addition to demonstrating fealty to Moscow, the effort was also used as a means of weakening opposition from powerful Jews in competing wings within Poland’s Communist Party. At the time, the purges that resulted were relatively contained, mostly affecting military officers and some journalists, as well as cutting off Western funding to some Jewish organizations operating in Poland. Yet, some eight months later, after the voices of the Party had laid responsibility for public unrest at the doorstep of the devious “Zionists,” the campaign entered a far-reaching and highly effective stage. Jews were purged from positions of power in nearly all sectors, from within the Communist Party itself to labor, the arts, academia, and, once again, the military. Newspapers continued to spew anti-Zionist rhetoric, associating Jews with the nefarious plans of the imperialist West. Mass rallies were held, often displaying distorted images of Moshe Dayan as a symbol of evil, and slogans such as “We demand the purge of the Party from Zionist filth” abounded. One such demonstration attracted as many as 100,000 participants. The movement, Prof. Stola said, had a strangely liberating effect on some in the Polish working classes. “Now there was a way for workers to speak out against their managers — by accusing them of Zionism or insufficient anti-Zionism,” he said. The phenomenon bore many of the trappings of Stalinist-era hate campaigns that, at various times during the dictator’s rule, had been launched against church officials, Jews, or other groups determined to be “enemies of the state.” The movement also rivaled the effectiveness of the Stalinist campaigns, both in ending the protests and in rallying a large segment of the Polish population against their Jewish compatriots. Many Polish Jews reacted to the campaign with utter shock and disillusionment. By and large, those Jews who had remained in the country after the Holocaust and through subsequent waves of emigration in the 1950s and 1960s were highly assimilated into society and viewed themselves more as Poles than as Jews. Among their ranks were enthusiastic supporters of the Communist Party, and even some hardline Stalinists. This response betrayed not only a strong sense of national identity among émigrés, but also the campaign’s effectiveness in depicting Jews as aliens within Polish society. The purges and public smear campaign were additionally unexpected because, prior to 1968, Jews in Poland enjoyed a relatively high level of freedom compared to their brethren in other Soviet bloc countries. Jews who wished to emigrate to Israel could do so with relative ease, far more so than a Pole trying to relocate to any other nation. In fact, during the early years of the state of Israel, the Jewish Agency paid Polish Jews to move there. Additionally, several Jewish organizations had been allowed to function, even with support from the Joint Distribution Committee and other international entities, something that was widely off-limits behind the Iron Curtain. Now seen as pariahs by the socialist society that many of them had embraced, Jews began to feel that they had little choice but to emigrate. By 1969, some 13,000 Jews had left Poland, out of a population of 25-30,000. Interestingly, only 25 percent of the alleged “Zionists” chose the state of Israel as their destination, with many more settling in Scandinavia and Great Britain. Even their departure to Vienna from Warsaw’s Gdański Railway Station was not without hardships, as it was not uncommon for guards to harass travelers and confiscate valuable possessions before they left the country. Prof. Stola concluded his lecture with a sad reminder that while largely banished from mainstream politics and media in 1968, 50 years later, strikingly similar rhetoric can be heard in Poland, mostly in the dark corners of ultra-nationalist social media forums. “Polish anti-Semites are very lazy and they repeat old models … In 2018, we see the same ideas being spread on the most democratic medium,” he said. The feature of the Polin Museum’s exhibit which proved highly controversial involved the display of statements from 1968 alongside those of recent years. Prof. Stola said that he and another museum official played a game of sorts, with one reading statements and the other guessing whether the line had been uttered in 2018 or 1968. Despite frustrations over lingering and even rising anti-Semitism in Polish society, Prof. Stola said that the record crowds that flocked to the museum testified to the continuing relevance of March 1968 to Warsaw in 2018. “The popularity showed that it was not just about the past, but about something that is still relevant today,” he said.